* * blue star stitcher* * : Goodbye Spring, Hello Summer! Teensy bit of progress on Ashley this week, mostly more filling in of the white on her dress. Boring! 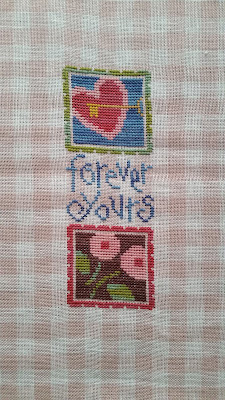 But still loving her all together, and hopeful to actually finish her this year and not banish her to the WIP pile. 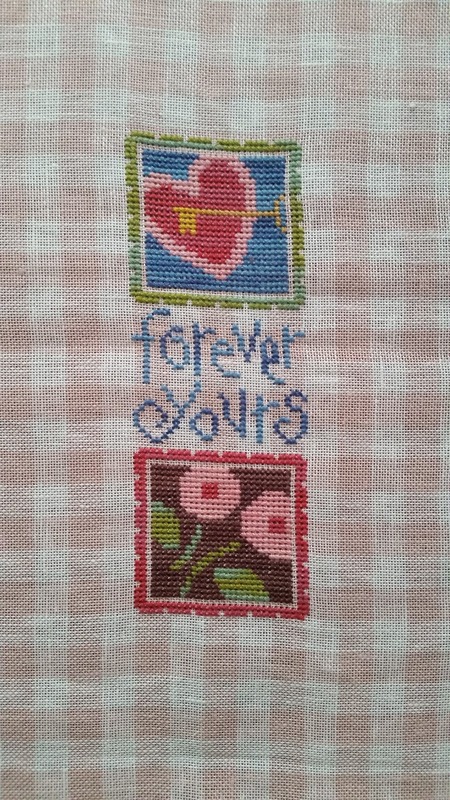 I refuse to call anything I have stitched on a UFO as I remain determined to finish them all someday. 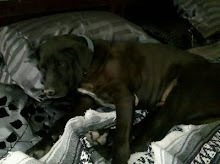 Here is what has been distracting me this week from Ashley. I started on Country Stitches "Wordplay-July". I won four of the months on Ebay, and love them. I did hedge my bets though, and instead of starting May started a little further out with July. Most of the colors are the ones charted, but I did change the Merman's tail to a greener blue (the chart had a weird stripe in his tail that I didn't love, and I changed the water to "Caribbean" by WDW. So all the words are done on this, I just have the ship in the middle and the fish along the sides. 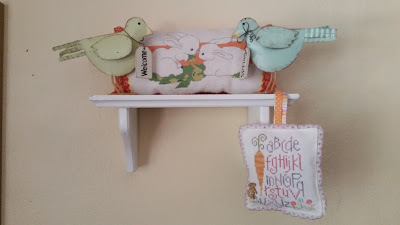 These two I purchased from another blogger "Nicole's Needlework". 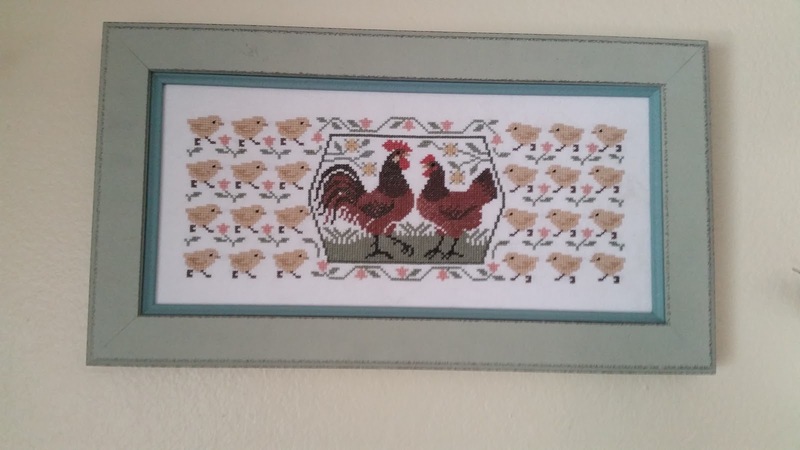 I thought they were both so cute, and the Bent Creek chart I already had in my stash, but it was low on the new project list. It is a very cute winter pattern, and the LK I plan to finish into a little pillow ornament. 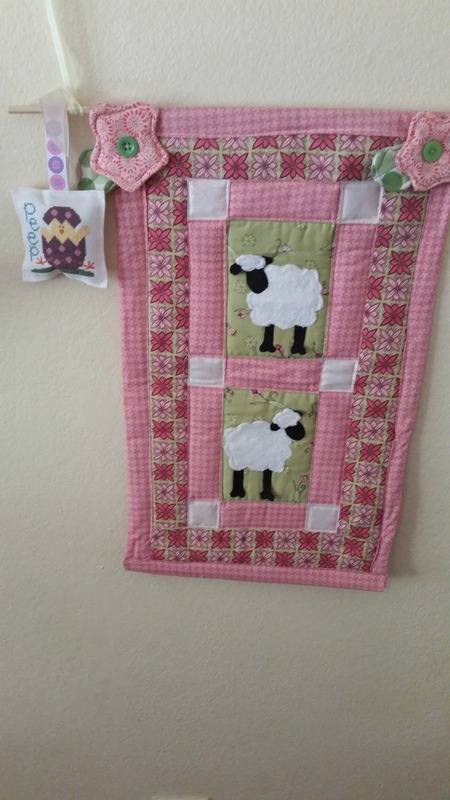 The pink gingham linen she stitched it on is adorable! So here in Arizona we are saying goodbye to Spring and rushing headlong into summertime with temps in the 100's today. I dipped into our pool for the first time last week, and the girls have been swimming the last few weeks already! 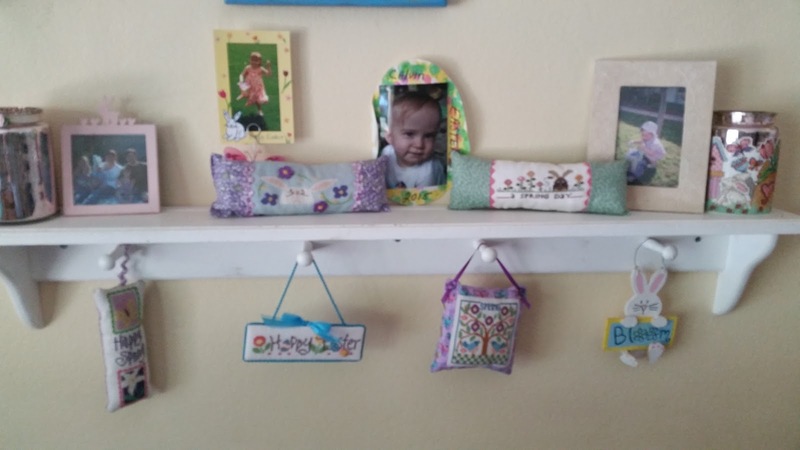 But I realize I didn't post any pictures of my spring display for Easter, so wanted to show them before taking it all down and replacing it with summer stitching. 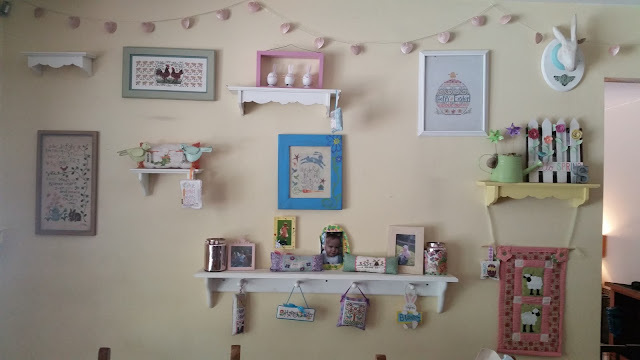 Here is all of it, this wall is in our dining room. I like to change it out for the different seasons. This is a "With thy Needle and Thread" piece I stitched two? years ago. 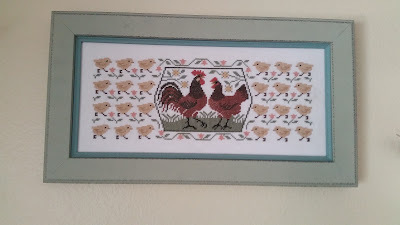 Just a simple square frame from Michael's for it. 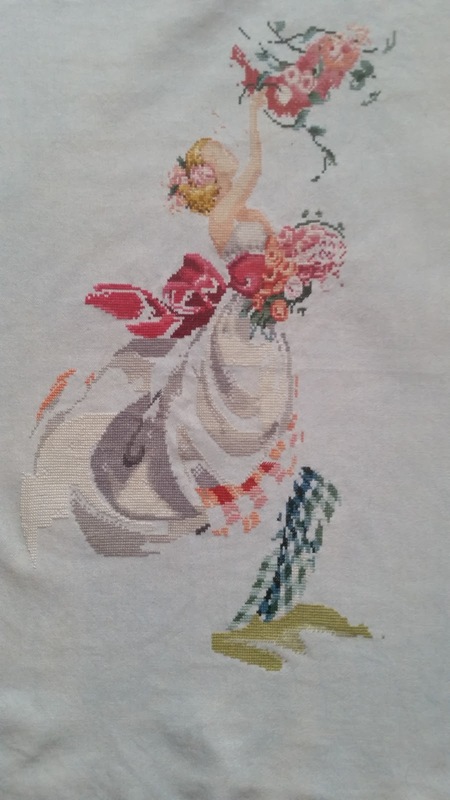 This one was not stitched by me, but found by my husband in an antique mall in Kentucky five years ago. According to the date on it, this one is turning 21 this year! A Prairie Schooler I just got framed last spring. Love the rows of baby chicks on it. I did not get glass put in on it and now I kind of wish I had. This pillow was stitched for me through the HOE blog for a spring exchange some years ago. The little LK pillow I stitched, and my mom was kind enough to do the finishing for me. It has a purple eyelet trim around the outside of it. Bent Creek "Hip Hop", stitched at least 6 years ago by me. Another Bent Creek "Uber Egg", I messed up somewhere in the middle so my egg is a little lopsided! A little LK pillow, and a quilt kit done by me years ago. My finishing skills were not that great for quilting, but I love the colors of it. And all of my little ornaments underneath. 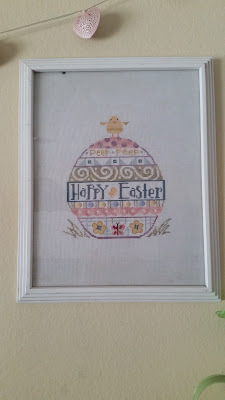 "Happy Spring" and "Happy Easter" by LK. Bent Creek bunny changed from brown to white, and "A Spring Day" from Heart in Hand I think? 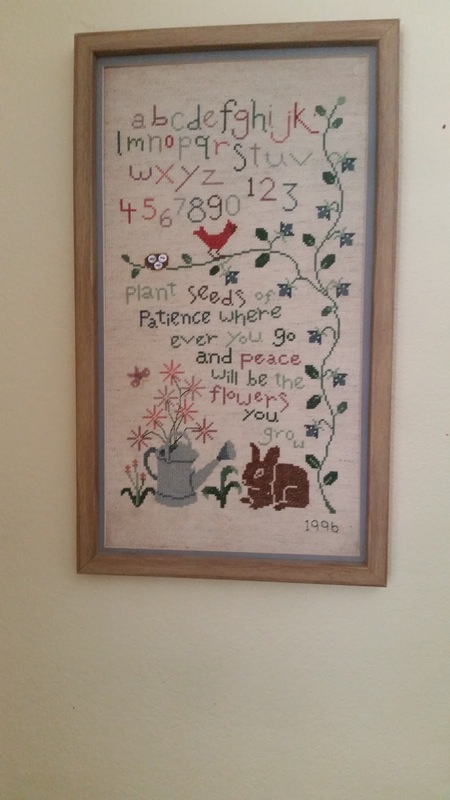 Your springtime wall is very pretty. 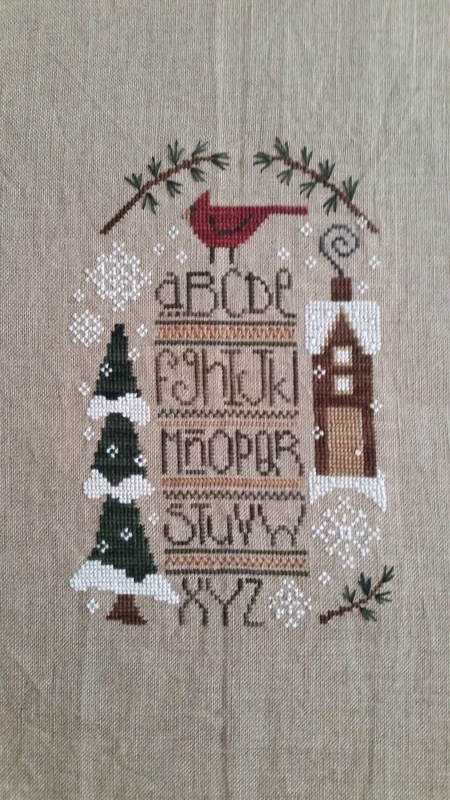 All of your stitching is so pretty. 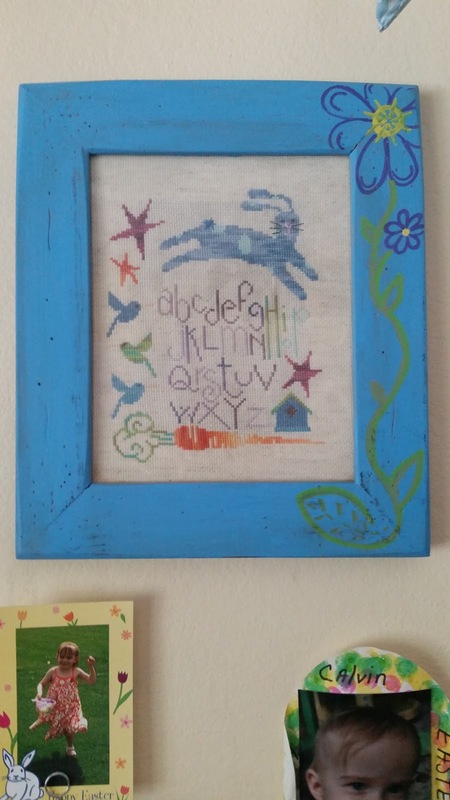 You have a lot of lovely spring projects on display. Love your Easter Display. So many wonderful projects. 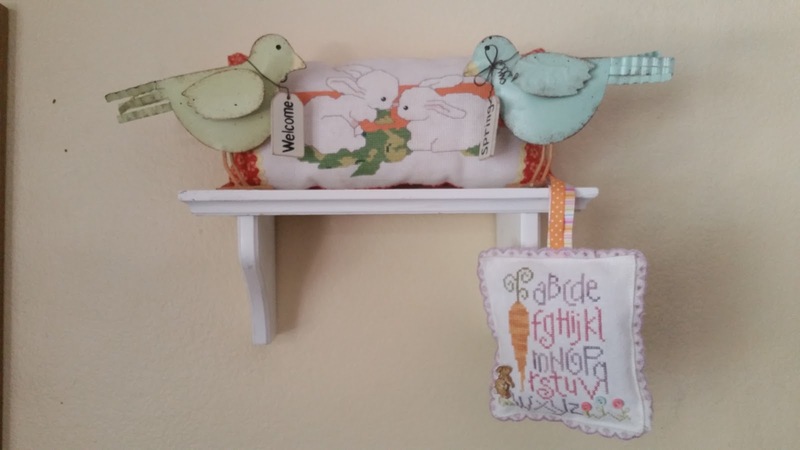 I still have my Easter things on display - I love your shelf. 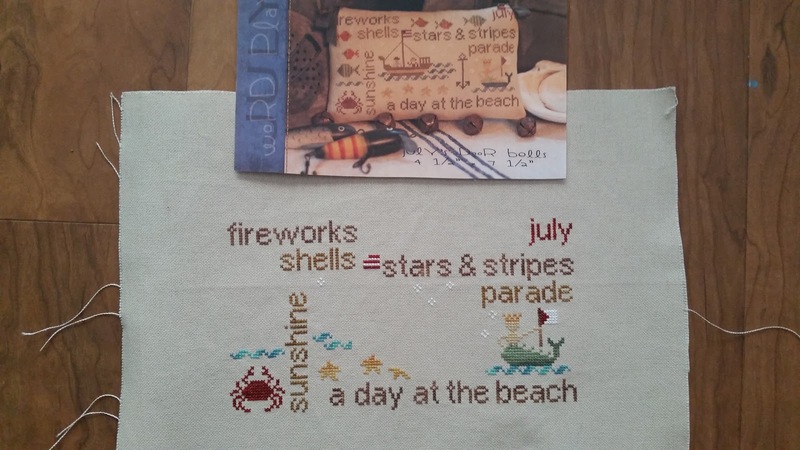 I have wordplay July in my stash. I love that pattern. Ashley is so pretty. I love your Easter display! It is so cute but I especially love the Uber Egg! Ashley is gorgeous. I am in AZ too and it looks like the triple digits won't be arriving this week! Love the Wordplay. I have two of the charts if you wanted to do a swap once you've finished the ones you have? 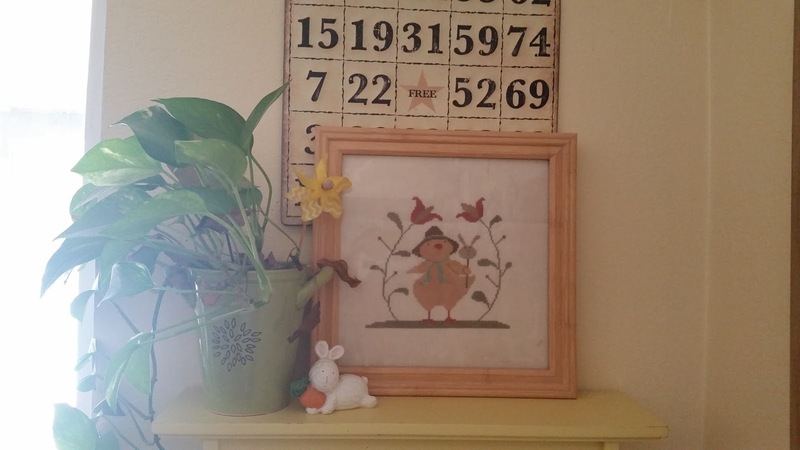 Your Easter display is beautiful too. I really like the idea of changing it seasonally. You've got some great pillow and ornie finishes there. So many lovely things in this post. Your wall does look pretty.